Three things I love in the Fall: autumn leaves, cozy family nights & comfort food! 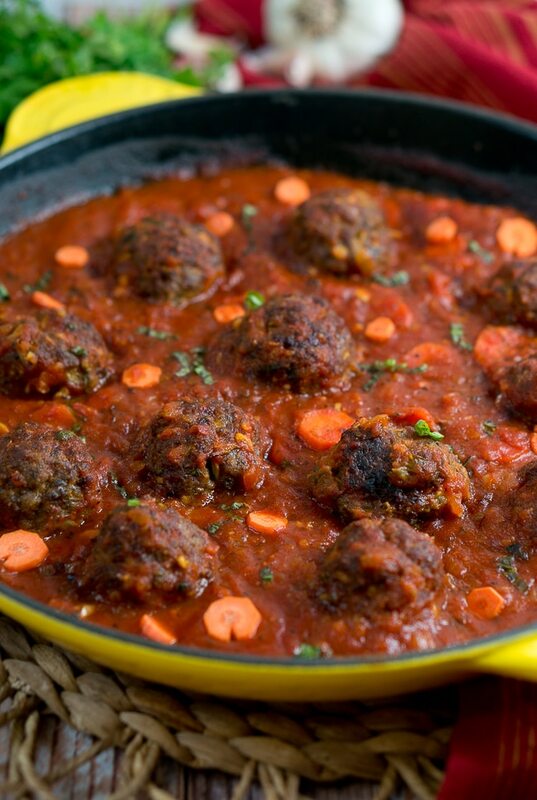 Today, I am sharing with you a delicious recipe for Paleo Meatballs with Marinara Sauce – true comfort food for this fall weather. You want to know something else that I love? Easy & delicious weeknight meals! I loved that I didn’t spend much time in the kitchen while making this meal and was able to spend more time with my family at the table. A special Thank You to Ragu for sponsoring this post and inspiring me to share with you one of our family traditions. I hope you will take a minute to visit our sponsor’s website to learn more about the Ragu heritage story and for great Ragu Pasta Sauce Recipes. Growing up, I enjoyed helping my mother and grandmother in the kitchen. It was always fun to watch them cook, help as much as a little kid can help in the kitchen (like licking cake batter off a spoon :)). They taught me how to cook, told me stories and we just had a good time. I learned a lot about cooking just by watching and helping with small chores. My grandmother taught me by example that cooking for your family is an expression of your love for them. She always told me that everything tastes better if it’s cooked with love. And I hope to pass down her love for cooking to my children one day. I grew up in Bulgaria, a small Mediterranean country close to the Black Sea, bordering south with Greece and Turkey. Since I’ve moved to the States, I have been wanting to learn to cook as many traditional family recipes as possible. 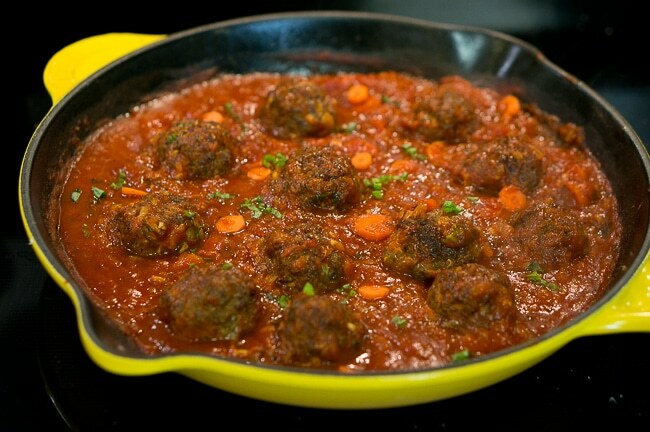 One of my favorite meals at home involved meatballs and with the help of my Mom, I was able to recreate those delicious meatballs and I am sharing the recipe with you today. I put my own spin on it by making it Paleo. Preheat oven to 400 F degrees. Line a baking sheet with parchment paper. Mix all the meatballs ingredients together in a large bowl. Shape the mixture into meatballs. (I ended up with about 30 meatballs.) Place all meatballs onto the baking sheet. Bake for about 30 minutes or until meatballs are done and browned. Saute chopped onion in a large skillet until translucent. Add to the skillet the chopped carrots and season carrots & onion with salt to taste. Cover with a lid and saute for couple minutes, until tender. Pour Ragu marinara sauce, honey and red wine over the vegetables in the skillet, and stir everything. Simmer uncovered for about 5 minutes. Add minced garlic and freshly chopped basil, and stir everything. Add meatballs to the marinara sauce and pour the sauce over them. Garnish with freshly chopped basil if you want. 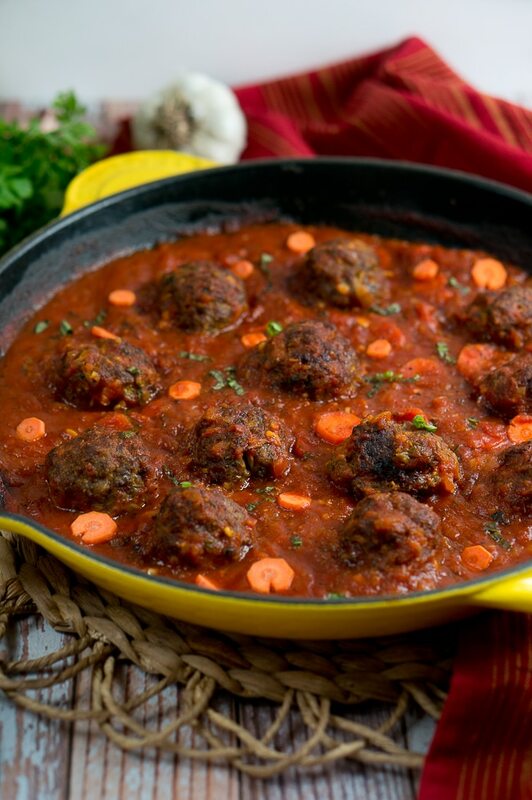 You can serve the Italian meatballs with marinara sauce over gluten free spaghetti, pasta or mashed potatoes. Enjoy! “This is the story of Assunta Cantisano. The story of a woman and a dream. Assunta made the voyage from Italy to America with a little something extra up her sleeve, her family’s recipe for tomato sauce– a secret and sublime combination of vine-ripened tomatoes, fresh basil, fennel, garlic and ground pepper, meticulously writing down every detail and hiding it for safe passage. She must have known she was onto something when the neighbor’s raved about it. Then the neighbor’s neighbors. Word spread, and when people in Iowa started grabbing it off the shelves, well, the legend was off and running. It wasn’t easy, Assunta grew up in a man’s world during our nation’s toughest time– the Great Depression. And in a time when people expected less, she gave them more. When people were forced to put their hopes, dreams and aspirations on the back burner, Assunta placed hers decidedly on the front burner. 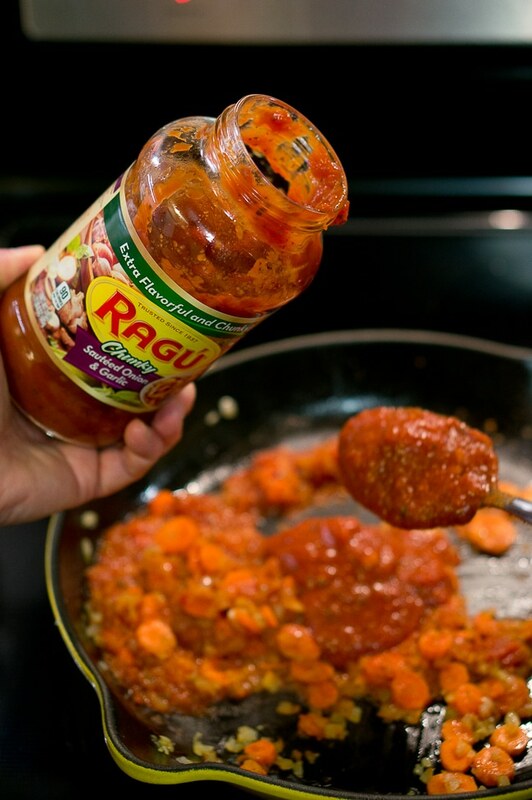 Her recipe literally became the recipe for her success…Thus, Ragú pasta sauce was born! Hundreds of pasta sauces have graced the shelves over the past 80 years, but only one has become America’s number one! Visit the campaign landing page to discover the Ragu heritage story! 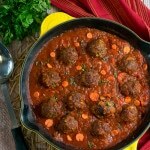 Paleo Meatballs with Marinara Sauce - Juicy meatballs in a tomato & basil sauce. Only 30 minutes! Perfect weekday comfort food. Mix all the meatballs ingredients together in a large bowl. 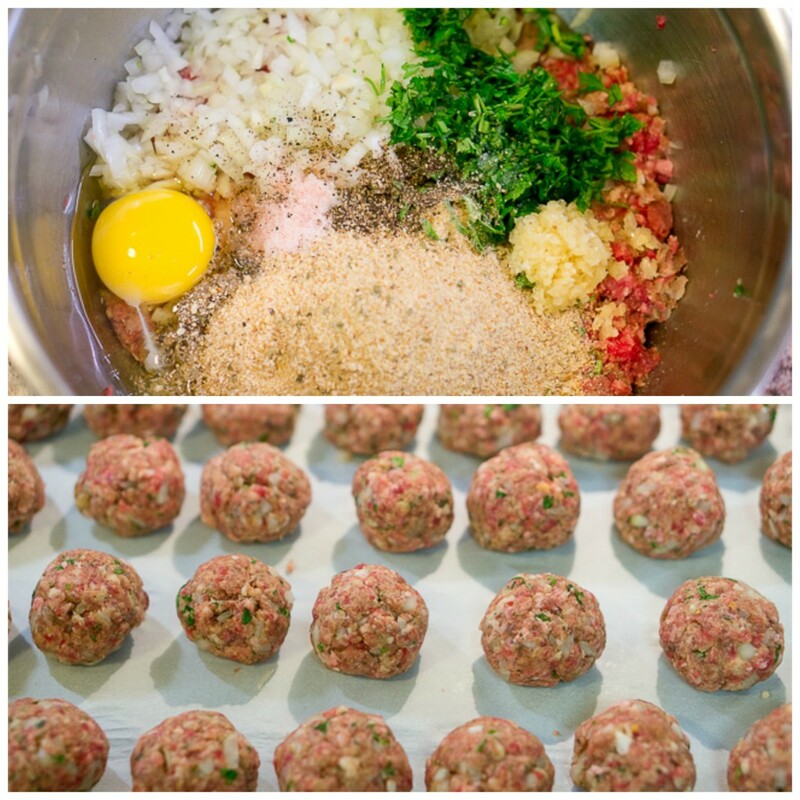 Shape the mixture into meatballs. (I ended up with about 30 meatballs.) Place all the meatballs onto the baking sheet. Saute chopped onion in a large skillet until translucent. Add to the skillet the chopped carrots and season carrots & onion with salt to taste. Cover with a lid and saute for couple minutes, until tender. Pour marinara sauce, honey and red wine over the vegetables in the skillet, and stir everything. Simmer uncovered for about 5 minutes. Fabulous recipe! Your photos are beautiful too! 🙂 Thanks for sharing! Thank you, Wendi! Glad you like it! Yum! This dish is gorgeous! So pretty and delicious looking too! Thanks, Kristen! Yes, these meatballs were the bomb! And that sauce.. yummy! That looks so good. Now I’m hungry for Italian, and it’s like 10:30 in the morning. I will have it for dinner. You two make a very attractive couple. Thanks, Faye! 🙂 I know, I am getting hungry myself. Hope you enjoy it for dinner! We don’t use marinara sauce very often but we love fried cheese sticks and marinara as a dip. I like to use Marinara sauce for my green beans – fresh green beans covered with Marinara and bake them in the oven so good! Rosie, that sounds absolutely amazing! 🙂 I will have to give it a try! I look to use marinara sauce to make homemade thin crust pizza. My favorite way to use marinara sauce is in stuffed eggplants. Yum! My trainer is always asking me for Paleo recipes so I think that is one that I am going to share with her! She buys about 15 lbs of ground beef a week for her and the kids so this will be a great recipe for her. She likes minimal prep and something that she can eat for leftovers! These look delicious! I love any excuse to bust out the cast iron skillet! What beautiful pictures! This recipe sounds so hearty and delicious and I loved reading how Ragu was started. Thank you for sharing! I use marinara sauce for lasagna and other pasta dishes. I like to use it over stuffed shells with veggies and ricotta. I like to use marinara sauce making baked chicken parmesan. I admit that’s one of my favorite ways to use marina sauce as well! Favorite way to use marinara sauce is on pasta. Marinara sauce and pasta is a match made in heaven! My fav way to use marinara sauce is in baked ziti. Love! I love meatballs and don’t make them oftenenough. Looking forward to trying these. Hope you give them a try, i know you will love them! Thanks for stopping by! I like to put it on spaghetti squash. Your photos are wonderful – they sure make it hard to sit on this side of the screen and NOT drool! I like it on top of spaghetti squash. I would love to try the Chunky 7-Herb Tomato sauce. One of my favorite ways to enjoy marinara sauce is with cheese sticks or bread sticks. My family eats marinara sauce on cheese bread sticks and cheese sticks when we are having a cheat snack. It would not let me pin using the pin on the rafflecoptor entry for some reason so I pinned from the post and took the entry option but since I don’t know what we were actually to be pinning wasn’t sure if this would count. That’s fine, Christy! Thanks for letting me know! My favorite way to use marinara sauce is over cheese manicotti. I like to use marinara sauce with meatballs also but I add spaghetti squash. I like using it in baked ziti. I like it on spaghetti and meatballs. I like to try the marinara sauce the most. Boy, how tasty it is! I like to use the marinara sauce atop of spaghetti. It makes it just right. I try to eat very healthy during the week so I will likely substitute ground turkey for the ground beef and pork. And maybe on top of a little whole wheat pasta for some extra fiber.